POSTS Precor Spin Bike Reviews – Which One is Best for You? 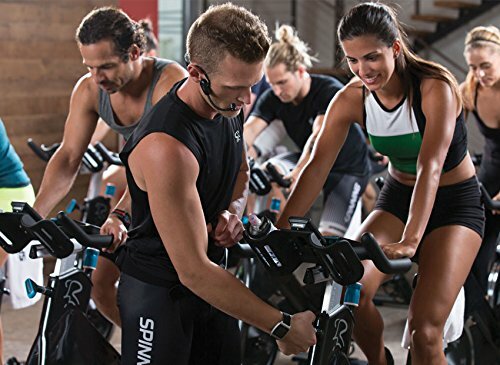 Are you interested to learn more about Precor spin bike reviews? After using many spin bikes, myself and carrying out extensive research, I recommend the Precor Shift for most people. The other popular option available is the Precor ride, which does provide many of the same benefits and features. However, there are a few key things that make it a secondary option compared to the Shift model. If you want to find out about what these Precor bikes have to offer you, take a look at our review below. I’ve covered all of the features, including the pros and cons, to ensure you’re given the full picture. By the end, you’ll have a much easier time picking between these two spin bikes. 7 Which One Should You Pick? 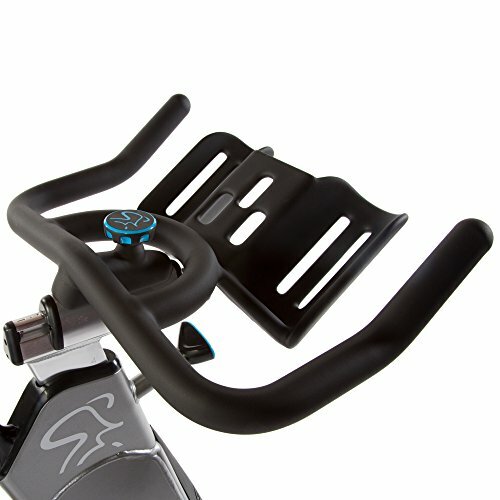 Precor has incorporated steel tubing materials to construct the frame of their Shift spin bike. The construction has been purposefully made specifically for resisting sweat and increasing strength. I liked how the pedals have been made with a double-sided design. This means you don’t waste time trying to fit your feet into the pedals in a certain way. They are also very durable, so you can be sure they’ll last you a long time. The overall construction of this bike is impressively stable. One of the main reasons for this is due to the structural resin that’s been coated in a rubber mould to increase how well the bike can grip onto the floor. So, while you’re riding, you will never have to worry about how the stable the bike will be. This allows for more intense bursts of exercise in a safer manner. The construction is also able to withstand a maximum weight capacity of 350 lbs. As far as comfort is concerned, I was impressed by what this spin bike has to offer. Precor has implemented a unique Q factor design. This simply refers to the distance in between each of the pedals. The Q factor ensures that the positioning of these pedals feels incredibly comfortable. It creates an ergonomic feel that allows you to ride in comfort every time. 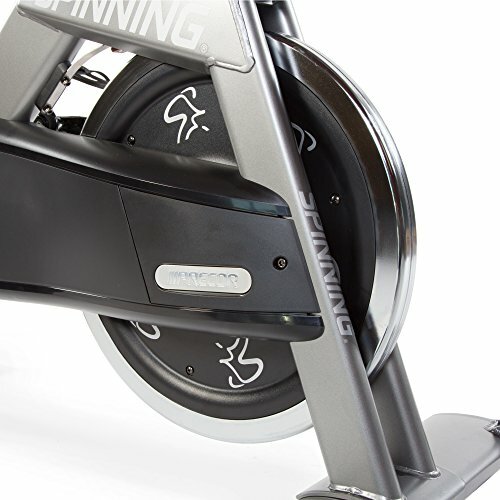 A major feature among spin bikes that people are concerned with is how adjustable they can be. This ties in heavily to the comfort features. You’ll be glad to hear that there are many fantastic adjustable features available with the Precor Shift spin bike. You can easily adjust how close or far you are form the handlebars by using the saddle slider. Changing the height at which you want to ride at is also easy due to the seat post adjusting settings. In addition to the saddle slider, you can also utilize handlebar slider that comes with micro adjustment features. This allows you to have complete control over the positioning of the handlebar. Many spin bikes seem to lack in the area of accessory holders. Personally, I find that I prefer to exercise with pieces of equipment that let me easily store things like my keys and phone. The Shift spin bike comes with a built-in tray that lets you store various items. Moreover, they have also integrated a dual water bottle holder too. This is another very important feature that I always lookout for when buying exercise equipment. Staying hydrated while exercising is crucial – both for your performance and health. There are edge-mounted wheels built-in to this bike, which make the job of transportation easier. However, this bike weighs 140 lbs, which is pretty heavy. Therefore, many people would struggle to manoeuvre it, despite the wheels. So, you may now be interested to learn more about how the Precor Ride compares to the Precor Shift. They are very similar in a lot of areas, however, there is one downside to this spin bike that puts it below the Shift. Precor has implemented steel materials to make the tubing for the frame on this model. I found that this provides the bike with a fantastic sense of durability and stability. Similarly, to the Shift, the model of the Ride provides that you with sweat resistance and strength benefits. 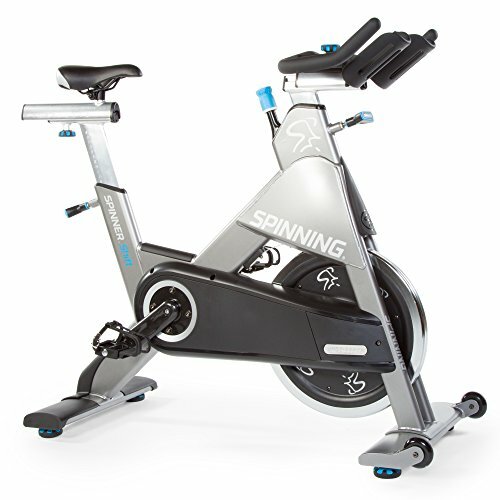 Precor has also incorporated their unique Q factor design feature with this Ride spin bike. As a result, there is a good distance between the pedals that allow you to ride for as long you want in complete comfort. I liked how the grip used on the handlebars feel very comfortable to hold too. You are able to adjust the saddle backwards and forwards by using the slider feature. As a result, you have the option to pick the exact distance that you want to be from the handlebars. You can also benefit from this slider feature when it comes to adjusting the handlebar too. However, they take the precision a step further here by allowing you even more adjustment options until you find the position that feels best for you. 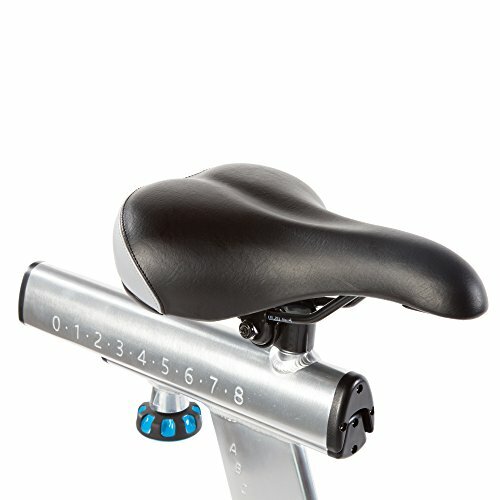 In addition to the saddle and handlebars, you also have the ability to alter the height of your seat post too. As I mentioned before, exercise equipment that comes with holders are a big benefit for me. That’s why I was glad to see that Precor has kept that standard the same for this Ride model. There is a designated tray for you to securely hold your phone while you workout. They have also implemented a water bottle holder which is within close reach. Therefore, you can easily grab a sip of water at any time during your workouts to remain hydrated. The transportation features of this bike are also similar to the Precor Shift spin bike. It comes with wheels that have been edge-mounted to make maneuvering it easy. However, the one noticeable area where the Ride outdoes the Shift is the ease that you can move it around. This is because it weighs 124 lbs, which is considerably lighter and takes less effort to move around than the Shift. There is one major downside that comes with the Precor Ride spin bike. Customers have noticed that when they’re riding it, the chain produces a lot more noise than expected. Therefore, if you’re exercising from home and there are people around, it’s likely the noise will disturb them. Not to mention, it can be very annoying to have to put up with. For me, the noise factor was a major let down. However, for others, the noise level may not be something that they’re so concerned about – it comes down to personal preference. Right off the bat, the Precor Shift is more expensive compared to the Ride model. You may have noticed that a lot of the features they posses are very similar. However, there are a few key areas that make the Precor Shift a better choice. For one, it has been made with a heavier frame. While this does mean that moving it around is harder, it doesn’t make it impossible. There are still wheels available to roll it around. The heavier frame design works to increase the overall durability of the bike. It also provides you with more stability while riding it. This is an especially great benefit for people who like partaking in high intensity interval training. You’re able to go all out for the intense intervals without having to worry about whether the bike will tip over. The other major benefit to the Precor Shift is how quietly it operates. Unfortunately, the Ride spin bike has a chain that produces a lot of noise. So, if you need something that’s sturdier, more durable, and quieter to use, I highly recommend the Precor Shift. The quiet operation of the Shift model and stronger construction were the deciding factors that made it our top pick. With the noisy chain on the Ride spinner, you can end up disturbing people around you. Moreover, if you wanted to set the bike up in front of the TV, you would struggle hearing it. The Shift spin bike allows you to cycle in a quieter environment that allows you to watch TV and cause less disturbance. Having said that, if you find the downsides of the Precor Ride easier to overlook, then I’d advise you to choose that one instead. The price is considerably cheaper and many of the benefits and features are the same. So, for people on a budget, the Precor Ride is still a fantastic option. It also weighs 124 lbs, which is less than the Shift, making it a little easier to transport if needed. But for those of you who are similar to me, the Precor Shift is the number one choice. A stronger frame and quiet operation are key factors in my decision-making process when it comes to fitness equipment that I’m going to be using from home. Be sure to use these Precor spin bike reviews to help you decide which one is right for you. Alternatively, you may also be interested to learn about other types of bikes. If so, check out this review to find out more about the best recumbent bikes for your home.